Upper Bicutan in Taguig gets water supply | Manila Water Company, Inc.
Photo shows Manila Water Taguig-Pateros Business Area team led by Manila Water East Zone Business Operations Group Director Esmeralda Quines (7th from left) together with Area Business Manager Diana Lou Gomez (10th from left) joined by Upper Bicutan Barangay Chair Alexander Penolio (11th from left) with the residents of barangay at the recently held projects update of the company in the area. Elevated areas like Upper Bicutan in Taguig normally experiences no water supply once pressure is reduced. With the help of two line boosters installed by Manila Water, residents of Upper Bicutan finally got water after weeks of intermittent supply. The installation of line boosters is only one of several technical and network solutions to bring water to high areas and those located at the far-end of the concession area. The two line boosters were installed in Goyena and Lapu-Lapu in Upper Bicutan, Taguig. 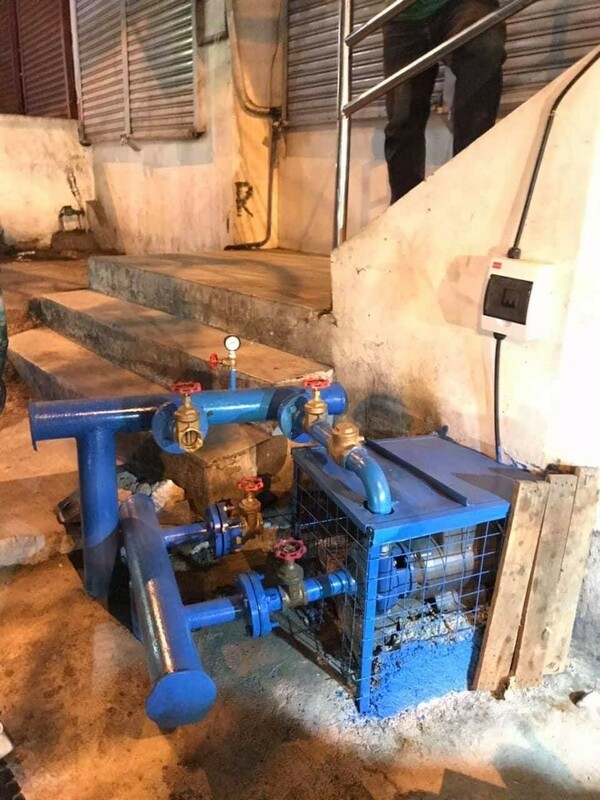 As looping and interconnecting lines are being installed in Gensan Capistrano, Manila Water continues to refill static tanks as a temporary watering point. Manila Water has installed two (2) line boosters at the highly elevated areas in Upper Bicutan, Taguig City. “We are pleased that our technical solutions are successful in Upper Bicutan. We continue to work tirelessly to be able to provide water for the remaining pocket areas that continue to receive water intermittently or less than eight hours. Our current objective is to provide water supply for at least 8 to 12 hours at least at the ground floor level This will enable our consumers to store water for their needs as we continue to implement our rotational water supply scheme,” Manila Water East Zone Business Operations Group Director Esmeralda Quines said. On the other hand, Upper Bicutan Barangay Chairman Alex Penolio thanked Manila Water for its unrelenting efforts to augment water supply for its constituents.